Debbie and Chris were honored to be chosen to write sections for two nationwide, contributory, hardbound books on legal topics in their areas of practice. 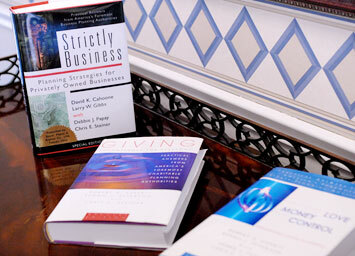 The first book was Strictly Business: Planning Strategies for Privately Owned Businesses, (Quantum Press LLC, 2002), followed by Love, Money, Control: Reinventing Estate Planning, (Quantum Press LLC, 2004). Both books use a question and answer format to simplify and explain complicated legal topics. Building on his prior experience as a contributor to The Charitable Giving Handbook (National Underwriter, 1997), Chris also became a contributing author to another hardbound book with a topic dear to his heart, Giving: Philanthropy for Everyone (Quantum Press, LLC, 2003). All four of these books are no longer in print, but some copies remain in northwest Ohio libraries and copies are available for examination in our office. 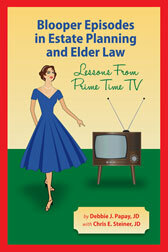 Debbie and Chris co-authored and self-published Bloopers Episodes in Estate Planning and Elder Law: Lessons From Prime Time TV (Olive Grove Press, 2012). This book uses imaginary show plots from popular TV series from the 1950s to 1970s to explain real life mistakes made by real people as we have observed in our law practices over the past three decades. A reader will learn about estate planning and elder law mistakes in short, easy to read, nostalgic and sometimes humorous stories. Real examples of consequences are explained. Learn what to do and what not to do for your own estate planning, as well as for that of your parents and adult children. Attendees at our New Client Orientation Meetings receive a free copy, while supplies last, one per couple. Fascinated by the stories her clients had shared with her, Debbie produced Lasting Love… How It’s Found, True Tales as Told to Debbie J. Papay, Attorney, Volume I (Olive Grove Press, 2014). This book is an anthology of “how we met and fell in love” stories, from 42 couples who stayed married for a collective total of over 1,970 years, not only through the challenges of daily life, but crises of health, family, career, finances-even war!-for between 25 and 65 years or more-and still counting. This collection was intended as a tribute to successful married couples and a legacy for younger generations. 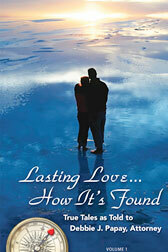 Debbie is currently seeking clients who have been married 30+ years to be interviewed for Volume II. All participants receive a small supply of free copies. In order to help dispel common myths and misconceptions about the V.A. 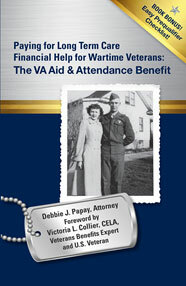 benefit for wartime veterans and their spouses of partial reimbursement of the costs of long term care, Debbie wrote Paying for Long Term Care * Financial Help for Wartime Veterans: The VA Aid & Attendance Benefit (Foreword by noted V.A. benefits expert, U.S. veteran, and Georgia attorney, Victoria L. Collier, CELA) (Olive Grove Press, 2014). This tax-free income is available for home health care, independent living facility care, assisted living care and nursing home care, but millions of our veterans assume they are not eligible or they unsuccessfully apply for the benefit. This book uses the TV shows I Love Lucy, M*A*S*H and China Beach to educate the reader about the benefit in simple, understandable terms. While supplies last, this book is also available at our New Client Orientation Meetings, one per couple.